The former cricketer is one of the show's new presenters. Freddie Flintoff crashed into a market stall during Top Gear filming over the weekend. Along with comedian Paddy McGuiness, it was announced last year that the former England and Lancashire cricketer had replaced Matt LeBlanc as one of the BBC show's new presenters. 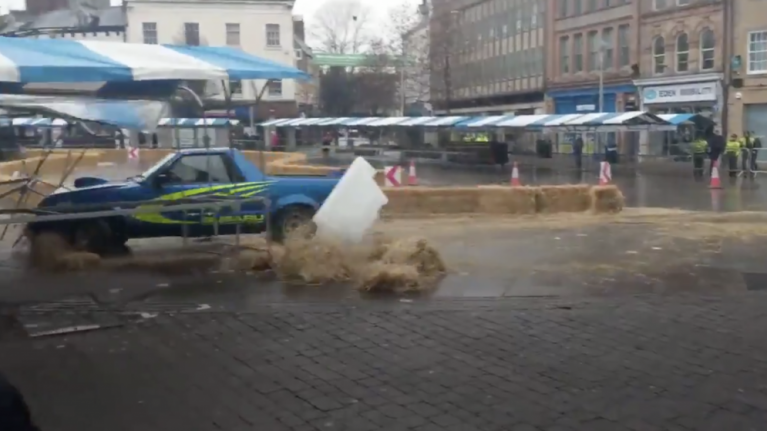 Flintoff had been taking part in a race with seven other electric vehicles in Mansfield town centre on Sunday when he crashed through safety barriers and into the stall. Footage of the incident, which is expected to be included in the new series, has been shared by the BBC on social media. As well as bringing in Flintoff and McGuiness, Chris Harris has remained as one of the show's presenters from the last season. LeBlanc had announced he was quitting the show last year. Saying that he had had "great fun", he explained that the amount of time taken up by the show and the extensive travel had seen him spend too much time away from his family and friends. "It's unfortunate but for these reasons, I will not be continuing my involvement with the show," he said. Jeremy Clarkson spins car into studio in first look at new series of Who Wants to be a Millionaire?